In this uplifting six-session video-based study, Stasi Eldredge shows how we can be content and at peace in spite of the circumstances in our lives-while at the same time not diminishing or dismissing the pain we are experiencing. Stasi reveals how we are each called to stand against the tide and go against the flow of this world, even when it is comprised of a strong current of despair and difficulty. Instead of denying there is pain or running from reality, we embrace the fact that God has broken into this world to cast aside the darkness. He is the God who laughs at the sneers of the enemy, stares suffering in the face, and proclaims that evil does not have the final word. As he does, he captures our hearts with a hope that defies death. To have joy in the midst of sorrow-or the current news feed-can seem impossible. And on our own, it is impossible. But just as the angel Gabriel said to Mary after making his outlandish proclamation that she, a virgin, would give birth to the Savior of the world, "Nothing will be impossible with God" (Luke 1:37 esv). God means for us to have peace-a peace from him that is defiant in the face of this broken world. Our hearts are to echo the heartbeat of our joyous God. This is not about skipping around the garden singing, "I'm so happy in Jesus every day," but about being present to engage whatever is coming our way with the confidence hope and assurance that God has our interests in mind and will see us through. Believing that sorrow and loss do not have the final word takes courageous joy. This requires a strength of spirit that needs to be nurtured. It requires us to trust in God's promise that he will restore all things-that death has no sting and the grave holds no victory over us. As we do this, we come to realize that while our visible world may scream loss, the ultimate victory cannot-and will not-be held back. Jesus has already won the battle on our behalf, so we can be people with courageous joy in the face of everything the world sends our way. 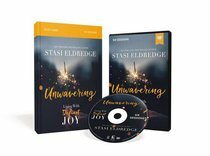 About "Unwavering: Living in Defiant Joy (Study Guide With Dvd)"
Stasi Eldredge, who is passionate about mentoring women in finding their true identity as the Beloved of Christ, has been leading women's Bible studies for years. With a BA in Sociology and formerly on staff with Youth for Christ, Stasi now leads the women's ministry of Ransomed Heart. She is married to co-author of CAPTIVATING, John Eldredge, has three sons and lives in Colarado Springs, Colorado.